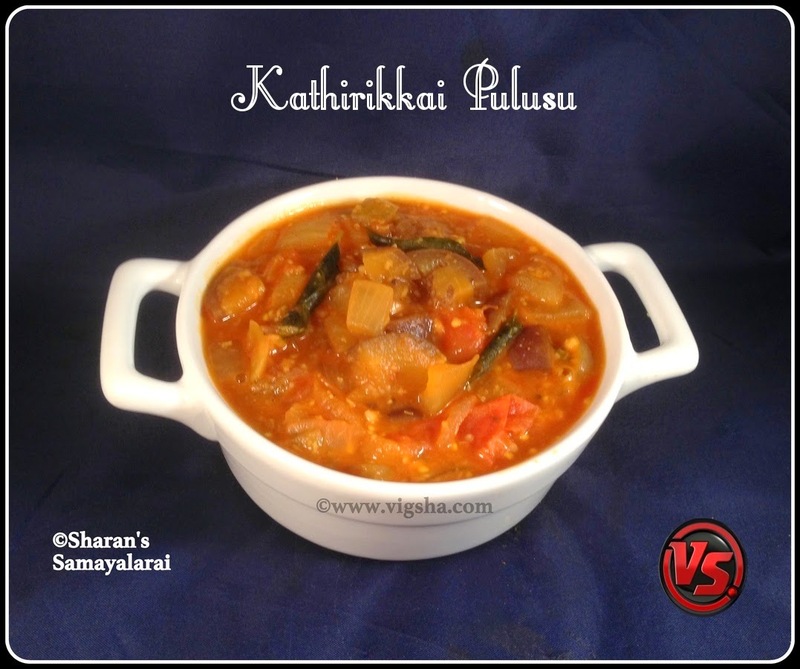 Kathirikkai Pulusu is very appetizing and tastes delicious with steamed rice. Egg plant is cooked in tamarind juice and seasoned with spices. In telugu, we call it as Vankaya Pulusu. 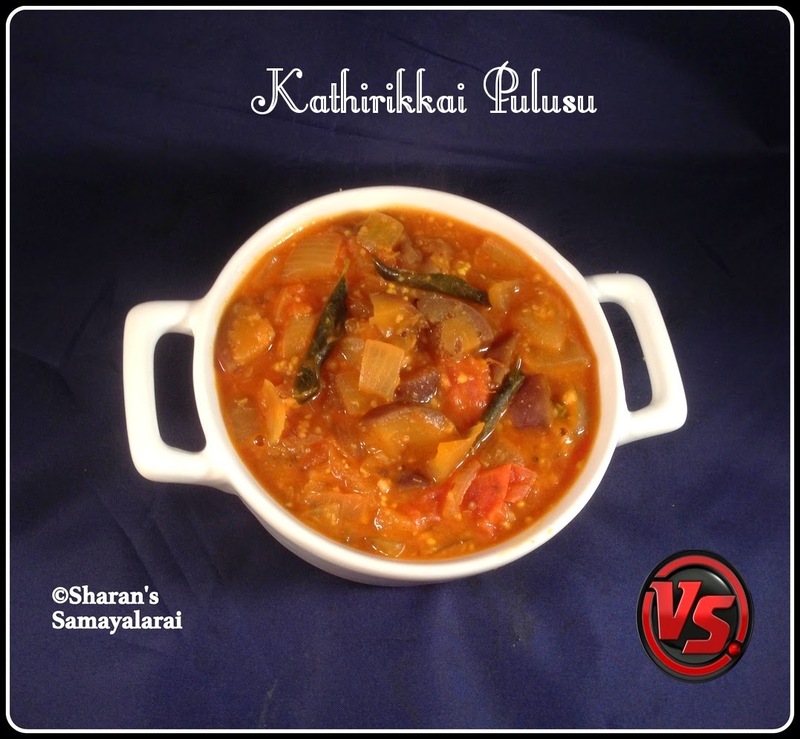 I am sharing my mom's recipe today.. Also check other Brinjal recipes which I have already posted :- Vangi Bath | Brinjal Rice, Ennai Kathirikkai Kulambu. Brinjal is considered as the king of vegetables. It is a common vegetable that is grown in all most all parts of India. They come in a variety of shapes and colors from small and oblong to long and skinny, from shades of purple to white and green. It is rich in vitamin A, vitamin B1, vitamin C, vitamin D, protein and calcium. The use of brinjal destroys the stones in its initial stage. 1). Wash the brinjal thoroughly and cube into medium size pieces. Keep them immersed in water until use to prevent discoloration. Extract juice from tamarind and set aside. Powder the roasted bengal gram and keep aside. 2). In a pan, add ½cup water, brinjal, onions, turmeric powder, chilli powder and tamarind extract. Mix together and cook covered. Once it starts boiling add the grated coconut and continue cooking till brinjals become soft. 3). Heat Oil in a pan, add mustard and let it splutter. Then add curry leaves, tomatoes and saute till it becomes mushy. Then add hing and switch off. Keep it aside. 4). Once the brinjal becomes soft(cooked), add the above saute contents to the cooked brinjal. Combine everything together. Finally add the roasted bengal gram powder and allow to simmer for 8-10 minutes till the curry thickens. Adjust salt and turn off heat. Yummy Vankaya pulusu is ready !! Serve with steamed rice and vadagam. Excellent eggplant recipe. Like to try it soon. Yummy and tempting pulusu,perfect with rice.